A government-appointed human rights group in Zimbabwe has accused soldiers of using “systematic torture” in a crackdown on protests. The Zimbabwe Human Rights Commission strongly criticised authorities for using troops to quell demonstrations. 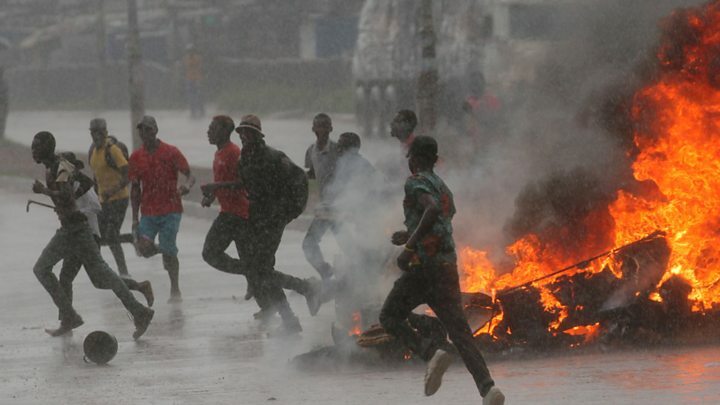 Unrest broke out more than a week ago following a sharp rise in fuel prices. Reports have emerged of assaults allegedly carried out by the military in various parts of the capital, Harare. Soldiers in Harare were seen beating a large group of minibus drivers on Tuesday. The BBC’s Andrew Harding in Harare spoke to a man who said he and about 30 others had been rounded up and beaten by soldiers for “more than two hours”. The most expensive fuel in the world? The continuing violence raises further questions about President Emmerson Mnangagwa’s control over the military, which helped bring him to power 14 months ago, our correspondent adds. President Mnangagwa has promised that abuses against civilians will not be tolerated. In a blunt statement, the commission said at least eight deaths had been reported since last week, “mostly attributed to use of live ammunition”. It said the torture was “organised” in that security forces targeted men close to where barricades had been erected, and near areas torched by protesters or looted. The commission detailed reports of security forces entering houses at night and making men, and even boys as young as 11, lie on the ground where they were then beaten. “The deployment of the army in quelling civilian disturbances leads to loss of life and serious bodily injuries and other human rights violations, yet the government continues to make such deployments,” the statement said. Other reports say at least 12 people have been killed and scores treated for gunshot injuries. More than 600 people have been arrested in relation to the protests – with rights groups and opposition lawmakers saying many have been detained arbitrarily. Pastor Evan Mawarire, a prominent activist who led the 2016 protests against Robert Mugabe, was arrested on 16 January and remains in detention. What is President Mnangagwa doing? On Monday Mr Mnangagwa, 76, broke off a trip to Europe to deal with the continuing unrest. He had been due to attend the Davos economic summit where he was expected to seek investment for Zimbabwe. Back in Harare, he took to Twitter to urge all sides to work together to fix a broken economy. The price rises were meant to tackle fuel shortages, but mean that Zimbabwe now has the most expensive fuel in the world, according to GlobalPetrolPrices.com . This led to angry protests in Harare and the south-western city of Bulawayo. Her mother, the school’s headteacher, was killed in last week’s protests after being hit by an army truck. The MDC said on Tuesday that five of its MPs had been detained and refused bail. The Zimbabwe Congress of Trade Unions, the umbrella group that called the protests, says its leader, Japhet Moyo, has also been arrested. Mr Chamisa told the BBC there was “no justification whatsoever of having soldiers with live ammunition, with guns, machine guns, AK47 on the streets, beating up citizens”.